I was a blog stalker for several years before I ever started Blissful Roots. There have been so many wonderful blogs/bloggers that have inspired me along the way. I thought it would be fun to share some of my very favorite blogs with you from time to time. So, today we start with Diana from Our Vintage Home Love. I've talked about her before. I absolutely love her style and her building skills are amazing! Here's a few of my favorite spaces in her home. The master bedroom. Isn't the barn door headboard beautiful? She made it herself! Her farmhouse bathroom. I would stay in this tub all day long! Here's her dinning room. Just like all her rooms, I love how she uses lots of clean whites with beautiful woods. The kitchen. The tiny jars of spices on the farmhouse table are my favorite! And her living room. Gorgeous! 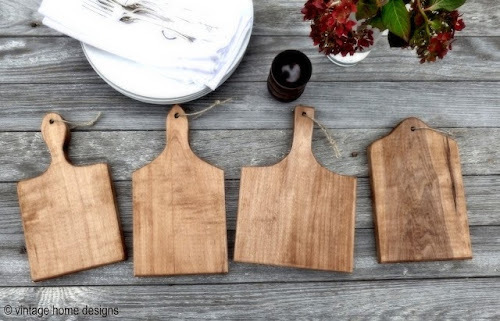 She also makes beautiful bread boards. You can buy them in her Etsy shop. The pictures speak for themselves! It's easy to see why I love Our Vintage Home Love, isn't it? I absolutely love the feel of her home! It has such a beautiful, natural, country feel. Exactly what I want my home to be like. Thanks, Diana for sharing yourself, your home, and talents! Go visit her today. What a great feature. Love it all! Hey, Rhonda. Thanks so much for stopping by! Diana's style is easy to love isn't it? Have a wonderful day and come back anytime! Wow! Love her style! Thanks for featuring Diana and sharing at Your Homebased Mom! Thanks so much, Abby! I'm so glad you came to visit. I absolutely love your profile picture! Come and visit any time. Enjoy your day! She does have a beautiful home. Thanks so much for sharing it with us. What a beautiful home! I love the soft neutral color and whites, paired with the warm wood tones. Ahhhh . . .
oooh I love finding new blogs! especially beautiful and creative blogs!! Love that home! I have to make sure it is on my list.